﻿ AVI to HTC - How to Play AVI on HTC Desire/Evo/Hero? Home » video » How to Play AVI on HTC Desire/Evo/Hero? How to Play AVI on HTC Desire/Evo/Hero? Though most of HTC mobile phones support playback various videos including 3GP, MP4, WMV, 3G2 and WebM, we still can not play AVI on HTC or can not play some of the AVI files on HTC. The following article just aims to solve this problem and helps to easily play AVI on various HTC smart phones. Play AVI on Desire: With its 3.7 inch AMOLED display for crystal clear viewing, HTC Desire has becomes one of the ideal phones for play video on the go. The updated HTC Desire HD make it more suitable for play HD videos with its huge cinematic 4.3-inch display, Dolby Mobile and SRS virtual surround sound. However, to one's disappointment, it still can not support playback the most commonly used AVI files. Play AVI on HTC Hero: As the first phone to feature HTC's own "Sense" software, HTC Hero is still widely used. How to play AVI on HTC Hero is also the often asked question. Play AVI on other HTC devices: the following guide also applies to play AVI on other HTC mobiles phones including HTC Sensation, HTC Rhyme, HTC Vivid and HTC TITAN, or even play AVI on HTC Tablets like HTC Flyer. The following will describe a step by step guide on how to play AVI on various HTC mobiles phones or play AVI on HTC Tablet Flyer. Free download the professional AVI to HTC Converter - Bigasoft MP4 Converter (Windows Version, Mac Version), install and run it, the following interface will pop up. In order to successfully play AVI on HTC, we had better convert AVI to HTC more friendly MP4 format. 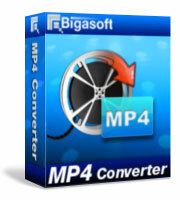 Bigasoft MP4 Converter is just the right software to convert various video formats to MP4 video format like AVI to MP4, MKV to MP4, FLV to MP4, ASF to MP4, and MOV to MP4 and etc. Then it is just easy to play various videos on HTC with the help of Bigasoft MP4 Converter. Click "Add File" button to AVI file to Bigasoft MP4 Converter. Click the drop-down button on the right side of the "Profile" to select HTC supported MP4 like "Android MPEG4 Video(*.mp4)" from "Android" Category. 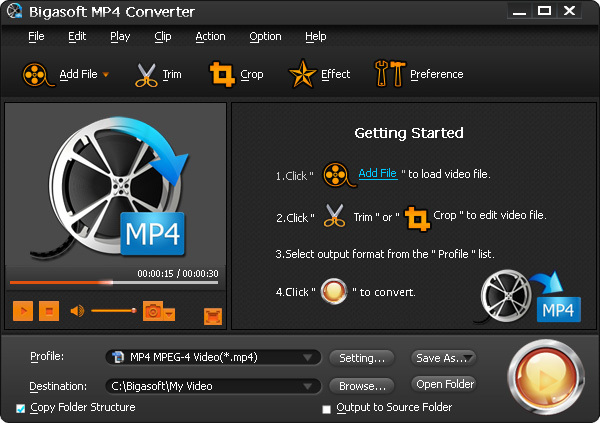 Click "Convert" button to finish converting AVI to HTC supported MP4 format. Stream and transfer the converted AVI to HTC just like transfer other videos to HTC. Then just watch the AVI file on your favorite HTC mobile phones or your favorite HTC tablets.